TT must be really in trouble to resort to what sounds like blackmail to me. They recently stopped their mobile phone service allowing customers to migrate to other providers with no penalty for remaining months on their contracts, it does seem they are struggling to stay one of the lowest price providers with zero usage limits. I have read today the £4 fee will allow customers to get a free replacement box should theirs break which if they are using it to access TT services regularly may not seem a bad deal. They must have given up trying to persuade people to keep it, as I posted earlier, took me 42mins. A massive own goal, i wonder if they will now have second thoughts and pull this stealth charge. I agree it is fine that they are going to repair or replace the box free of charge , but if they stopped customers migrating for free then the £4 seems too high.? 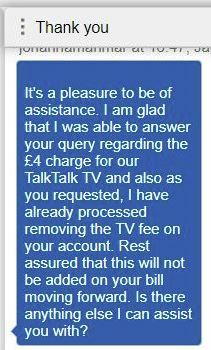 If you've connected a YouView box to your home network since November 2018, you've silently been deemed to be a "customer" of TalkTalk TV. This fact does not appear in the website Account pages�instead, it says you can "Add TV." This service used to be free, but will cost GBP4/month from February 2019. If you don't want to be charged, you must opt out. You can do that via chat, the TT forum, and presumably traditional phone/letter. - DVB-T/-T2 ("Freeview"). You can record, watch, pause and rewind live TV. - Non-TalkTalk player apps on the YouView box, e.g., BBC iPlayer, All 4, Netflix. - Renting or owning movies via the TalkTalk TV Store. - TalkTalk Player (i.e., watching On Demand content from a TV Boost channel in More TV). - Watching existing TV Boost content. I'm not a TalkTalk spokesman. No warranty expressed nor implied; E&OE. Please let me know if you see any errors or omissions. I'll try to keep this list updated as new info comes to light. - Existing TV Boosts (on the YouView box only)." Are you sure about that ? The information on the TT forums seems to indicate that opting out loses access to TV boosts. I don't recall that statement being made on the TT forums. Great question; thanks. I have conflicting information, so I've asked for confirmation. Karl has clarified. Thanks again for spotting that. If I'd paid for TV Boost I'd be pretty cheesed off about now!